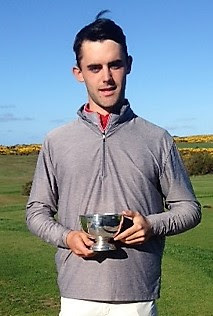 Nairn Golf Club scratch junior Hamish McColm won the North of Scotland boys' championship for the Spence Trophy by 10 strokes at Hopeman Golf Club this week. McColm, pictured, had scores of 69 and 70 for a total of 139 against a CSS of 68 for both rounds. Three players finished on 149. Jake Williamson (Fortrose and Rosemarkie), 76 73, was placed second with the best second round; Jack Hart (Grantown on Spey), 72 77, third and Jamie Mackintosh (Nairn), 70 79, fourth. Raegan Main (Hopeman), who had scores of 76 and 75 for 151, won the crystal medal for the lowest scratch total by an Under-16 years competitor. The lowest net aggregate award, the Alister Paterson Trophy, was won by Alex McGillivray (Nairn), who plays off 12, with net scores of 77 and 69 for 136. Billy Devine (Elgin), also a 12-handicapper, had the same net total of 136. McGillivray won with the better second round. 139 H McColm (Nairn) 69 70. 149 J Williamson (Fortrose and Rosemarkie)76 73, J Hart (Grantown on Spey) 72 77, Jamie Mackintosh (Nairn) 70 79. 154 W Nicol (Nairn Dunbar) 75 79. 162 A MacDonald (Skye) 79 83. 167 G Ross (Brora) 88 79. 168 R Bushnell (Fortrose and Rosemarkie) 79 89, N MacKenzie (Muir of Ord) 77 91. 170 F Wickenden (Nairn) 89 81, A MacAskill (Skye) 89 81. 198 O Marples (Nairn Dunbar) 113 85. 136 A McGillivray (Nairn) (12) 77 69, B Devine (Elgin) (12) 66 70 (McGillivray won with better second round).